You came to the beautiful Riviera Maya TO ENJOY PARADISE. 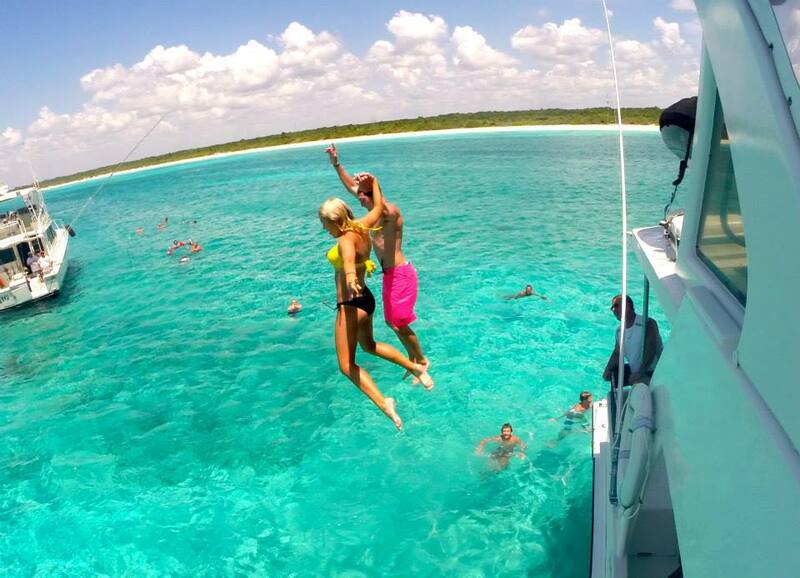 let's double those memories with an unforgettable day on your own private yacht! The region alone is one of beauty, but seeing it from land is only half the experience! The Caribbean Sea is where the real magic happens. Postcard views, clear turquoise waters, sea turtles, reef fish and sunshine! When you and your group step aboard with us, you become family and our yacht becomes your home. We have a wonderful itinerary planned with all kinds of activities you'll learn about below. Of course, as the unofficial captain you can customize your day however you can imagine. Use this page as a guide to discover all of the things included in our yacht tours. We're located in Puerto Aventuras, just 20 minutes south of Playa del Carmen, 15 minutes north of Akumal, 30 minutes north of Tulum, an hour from Cancun and 1 hour 30 minutes from Playa Mujeres. Our yachts are right next to Bamboo Café in Puerto Aventuras. "Lots of laughs and antics!" Rates below are for a 4 hour charter, regular rates based on averages for each group size. The rates below are for our two larger yachts pictured here. Piratas de Tejas and Los Dos Piratas. You have 19 adult guests and 4 kids ages 12 or under — you would still be in the 1-19 paying adult bracket. We welcome payment methods of any variety! Guests can each pay for themselves, the whole payment can be made by one person or family (only requires a 50% deposit), split payments, etc. Just get in touch, and we can work it out! Rates below are for a 4 hour charter on our 47' Italian Azimut, "Los Tres Piratas". Round-trip transportation not included. $15/pp from Riviera Maya, $20/pp from Cancun or Tulum. This sale is for new bookings only. The cruise with the most booze... Non-stop top up! As soon as you arrive to the dock you'll be greeted with a refreshing rum punch... from there on out, it's non-stop choose your own adventure. We have margaritas, strawberry and mango daiquiris, piña coladas, mixed cocktails, shots, national beers as well as plenty of water, juice and soda. Premium Liquor upgrades available. Click here to see our premium open bar and bottle service options. 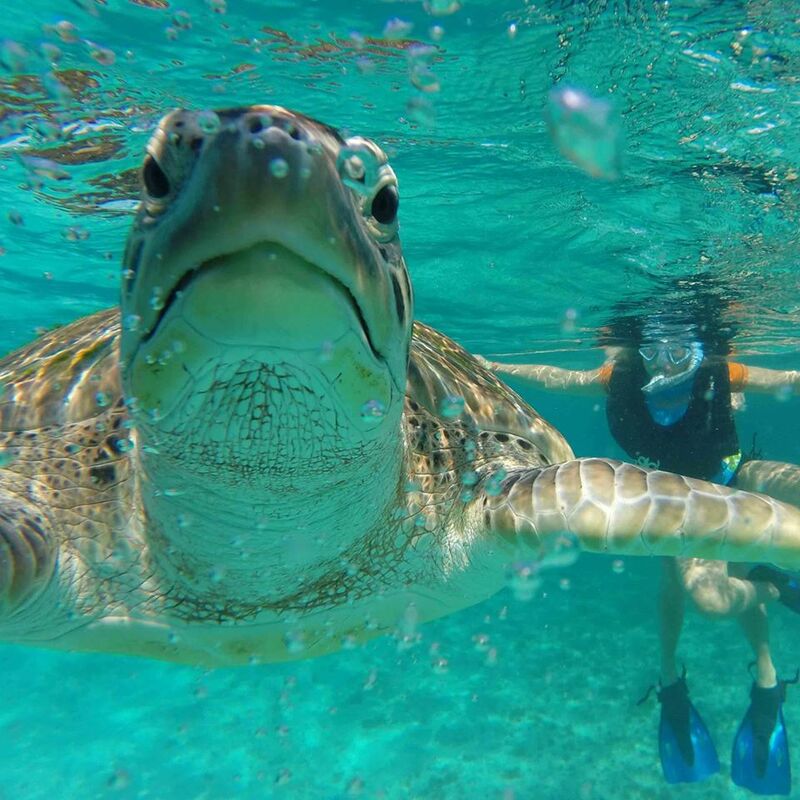 Swim in the blue Caribbean and meet your new Sea Turtle BFF! If you haven't thought about it before, think about it now! 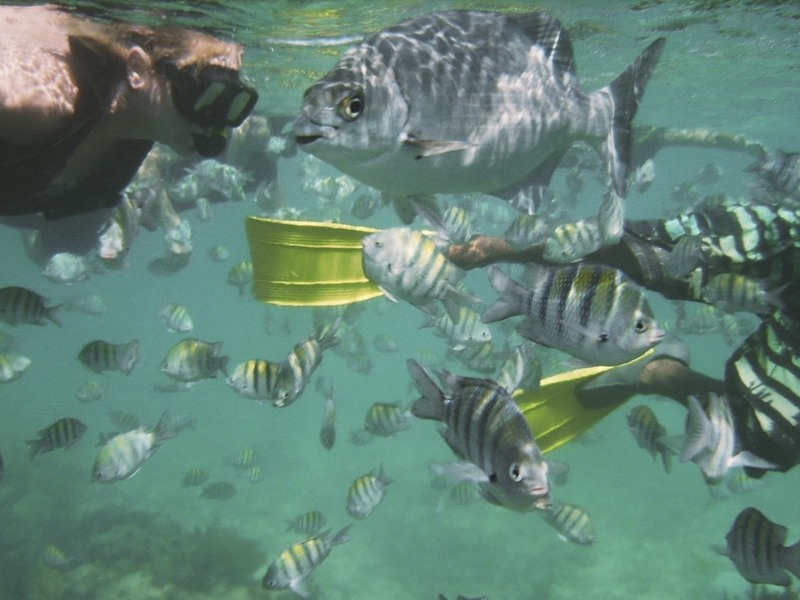 You could be swimming with gentle, prehistoric sea turtles in tropical waters surrounded by reef fish. If that wasn't on your bucket list already, it should be now. About 80-90% of the time when we head to the reef we get to swim with these beautiful sea turtles. 100% of the time you'll also be surrounded by colorful and wonderful reef fish. Fishing in the Riviera Maya: You catch, we cook. You eat, we clean! 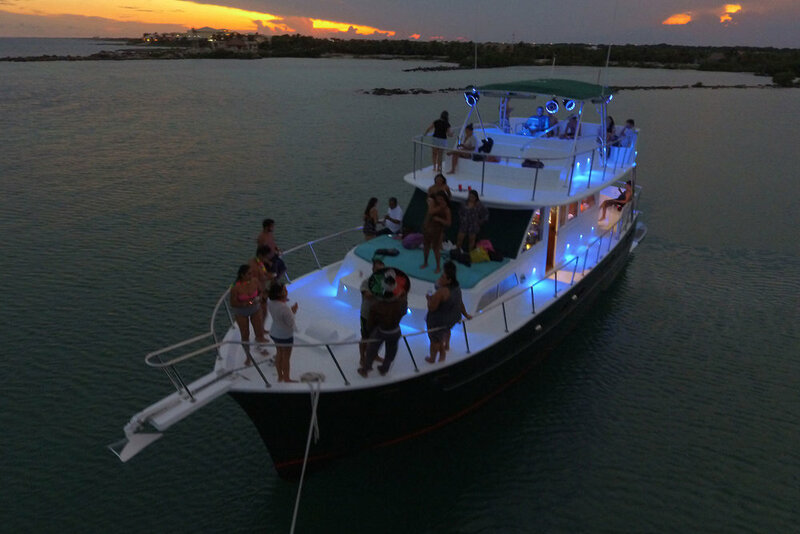 Available only on our 72' yacht, Piratas de Tejas. Prime fishing season in the Mayan Riviera is typically from late April through to the fall months. That doesn't mean we don't still reel in some catches during the winter — but the odds are much more in our favour during the summer months. Of course, fishing is a game of chance, so while we can't guarantee a catch, we can guarantee if we do hook something nice we can prepare something with it for your whole group! It cannot get fresher than that. Every tour comes with fishing included! We fish the entire way to and from the reef, forty-five minutes each way, totalling about one hour and thirty minutes. Want to fish longer? Just say so when making your booking, you're the Captain after all! Looks like wahoo ceviche for lunch! Some of the boys, "fishing" at the back deck. Other than catching cocktails, some fish you can expect to see might be dorado (also known as Mahi Mahi — excellent for ceviche and grilling), wahoo, barracuda, skipjack, bonita and, although much more rare, sailfish. Don't know much about fishing, but want to give it a shot? Just say the word! Our crew are pros and are happy to help show anyone who is interested all about fishing off the coast of the Mayan Riviera. Well fed sailors are happy sailors! Every tour comes with snacks served at the beginning and a full meal for all served in the final hour of the tour. Even though we do serve up a full meal, it's nice to come having already eaten so you're feeling good for all the sun, sea and fun! If you've cruised our Trip Advisor page, I'm sure you've come across mentions of our food. This fire grilled chicken is a complete delight to so many of our guests that we've been asked countless times for the recipe — which is kept under lock and key. Looking for a veggie or pescetarian option? Just let us know when you book! None of that mass produced stuff that is secretly squeezed out of packaging behind closed kitchen doors! Every tour we make it from scratch right at the beginning for snacks as well as included in the meal. In Mexico we do salsa a little differently. It doesn't come in sauce form from a can — it comes fresh every tour! Diced by our private chef aboard the boat, you'll love the refreshing taste of a proper pico de gallo. We also serve a habanero version, so keep an eye out for the bowl with the pepper in it! In addition to the chicken, guac and pico we serve up Mexican style rice, tortillas, tortilla chips and beans. The entire meal is gluten free! All of our meals are gluten free. Whether you're looking for gluten free or not, this is how our meals have always been prepared. In Mexico, we make the tortillas and chips traditionally with finely ground corn, salt and hot water. That's all it takes for the perfect tortilla. Our tortillas are all made fresh that same day. Get a little adrenaline going by jumping off the top deck... then sing your heart out on karaoke! Where else are you going to find this kind of fun? Jumping off the top deck of your private yacht, then coming back aboard to let loose some karaoke on HD TVs with over 18,000 songs. Not sure about taking the stage? Our good friend tequila can fix that! Once we drop anchor, it's game on! 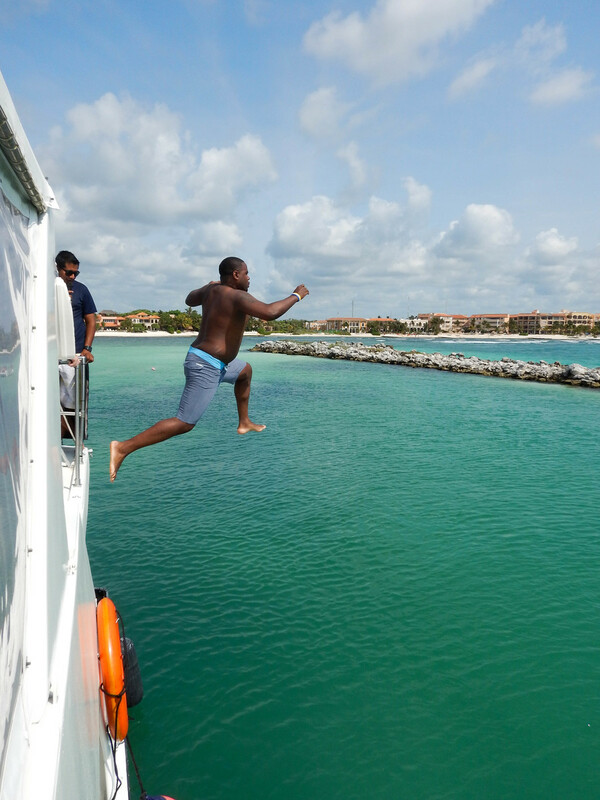 Head up to the top deck, and plunge straight down into the Caribbean Blue! We have thousands of songs to choose from and screens with the lyrics displayed. Or, if you know the song off by heart, you can be right up front at the bow singing on top of the world. Just want to play your own music? Great — bring down any device that has a headphone jack and we can plug it into our system. iPhones, iPads, any other smartphones, laptops, you name it. This is crazy talk! I'm ready to book my charter now! Another great way to get in touch is using that handy little chat box you see at the bottom of the screen. If you don't have a hotel booked yet, just fill in "Not confirmed"